Here is a trick question for you: What was the most deadly war fought in the Western Hemisphere? What, the American Civil War? Not even close. Just as we were fighting our Civil War (which I don’t think is quite over yet), the tiny country of Paraguay decided to invade Brazil. Soon, Argentina and Uruguay joined in against Paraguay, in what is called the War of the Triple Alliance. By itself, Brazil had the resources and the manpower to crush Paraguay. But the war went on from 1865 to 1870, during which 80% of the total population of the little inland country lost their lives. The man behind the war was dictator Francisco Solano López (shown below), better known for his obesity and rotten teeth than for his military prowess. Oddly, this was a war on which there were heavy casualties on both sides. Who knew that the starving Paraguayans fought like the devil and wouldn’t just play dead. They also had one self-trained military genius, a young railway engineer named George Thompson. 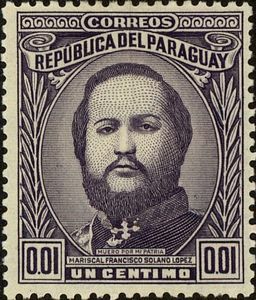 He designed the Paraguayan fortifications at Curupayty to take his adopted country’s weaknesses and turn them into strengths. The Allies took Curupayti as a terrible blow. Argentina lost any remaining enthusiasm for the war, and the greater share of the fighting now fell to the Brazilians. Allied strength was built up to 80,000, but even the Brazilians struggled to find the numbers. Brazilian rural life was fractured by violent recruiting gangs, and eventually the plantation slaves of Bahía were drummed into the ranks on the promise of freedom and land. The cost was debilitating at £14,500,000 a year, of which £2,000,000 went on maintaining the horses of the imperial cavalry. All sides were now desperate for a conclusion. Curupayty held out for another year. At first the Allies were paralyzed with shock, and then the ranks of both armies were liquefied by cholera. López was so terrified by the disease that he forbade anyone to mention it by name, and it was only known simply as “the Chain.” It claimed fifty men a day for six months….. When Curupayty was finally abandoned, Thompson mounted the earthworks with one last, sullen garrison. The wary Allies shelled them for three days before mustering the courage to advance. They were in for a bitter surprise. The last defenders of Curupayty were merely scarecrows, stuffed with straw. Meanwhile, the Allies poured fire down on to the defenders. The Paraguayans responded with all they had left, often just blowing their túrútútús—or trumpets—and infuriating the Allies with their stoicism. They dug themselves fox-holes with names like the Hotel Français, de Bordeaux and Garibaldi fed their gallows humour. Do you wonder why I want to visit Paraguay?